After the disappointment of the draw against Crystal Palace, and the draw against Bournemouth that preceded the Palace game, we’d now managed to find ourselves in a bit of a poor run of form in the league. Two wins in eight poor, to be exact. Lots of good football- largely from a crop of young, hugely promising players, isn’t quite getting the results it’s been threatening to. Profligacy in front of goal, and a frustrating inability to defend crosses from out wide (especially those of the corner variety), have meant we went into the game with five wins from the opening fifteen of the season, leaving us seven points off Man United in fourth. The same team that ended the game against Palace on Monday night took to the field against Norwich, with Leighton Baines coming in for Brendan Galloway, and Tom Cleverley continuing in place of the injured James McCarthy in central midfield. 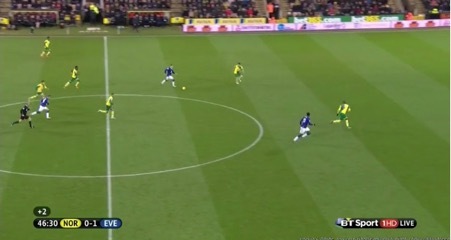 Lukaku managed to outmuscle his marker at the back post, and headed back across Rudd, into the Norwich net. 1-0 Everton. On Monday night we’d been so wasteful with our chances, allowing Palace to take the lead in a game Everton were in control of: it was a relief to see us take the lead so early. A disappointing moment for Deulofeu, particularly as a similarly promising break with the ball at his feet on Monday night came to nothing. We were exuding confidence in our football. 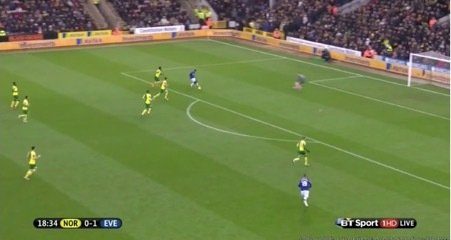 Shifting the ball from wing to wing patiently, back to front, waiting for the right opportunity to spring into life, and it didn’t take long for the toffees to carve a superb chance through the heart of the Norwich defence. 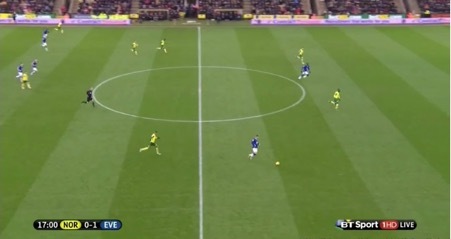 Sixteen patient passes until the ball was worked via Lukaku into the run of Arouna Kone…. With time to shift the ball onto his right foot, Kone was unconvincing. Rudd came charging out and blocked the shot. An excellent chance, forged by patient, but deliberate play from Everton, but lost at the feet of the increasingly goal-shy Kone. None since November 1st now for the Ivorian. 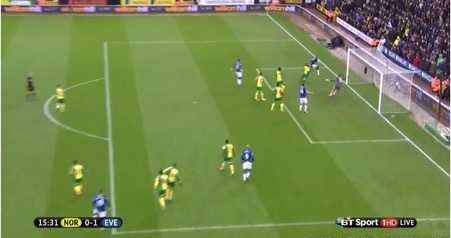 But a heavy touch from the Belgian meant nothing came of the attack, with Deulofeu in an ideal position to receive the ball from Lukaku as he made his run between the two Norwich defenders. Another potentially very good chance was to come and go. 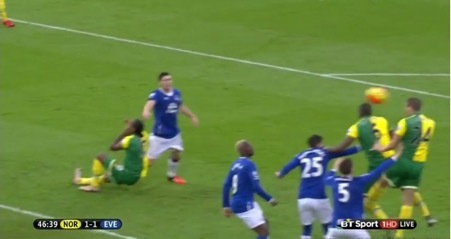 Everton were playing well, Norwich were not. But somehow, the ball managed to skew badly wide off the Belgian’s right boot. Fifteen of Lukaku’s now fifty one goals in royal blue have come off his right boot, which makes this all the more frustrating. It didn’t appear to take a bad bobble, just a lack of concentration, perhaps? More wasteful play in the final third from the toffees, the only surprise being on this occasion- it came from a man who’s now scored in his last seven outings. 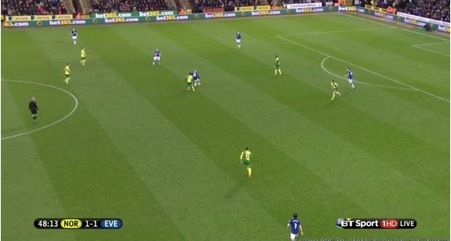 There are six Everton players in shot here, and only six Norwich defenders behind the ball, but a chance never really came from this. 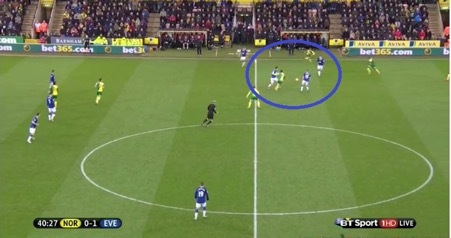 Although it isn’t the most extreme example of Everton’s attacking impotence when faced with a decent opportunity, it is indicative of how with a little more care for the ball, we could have been two or three up by this stage- such was our comfort. Runners from deep were going unchecked: Norwich couldn’t get to grips with us, and yet: our slender advantage remained. Who drove a thunderous right footed half-volley against the Rudd’s left hand post, which would bounce clear to safety. Unlucky… Bad finishing… Bit of both? Another chance came and went. 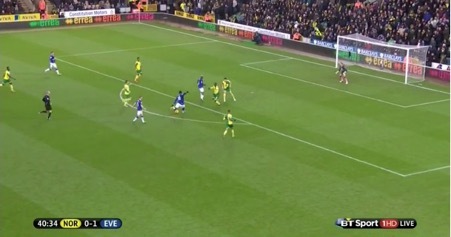 Everton were ripping Norwich to shreds, but still it remained 1-0. 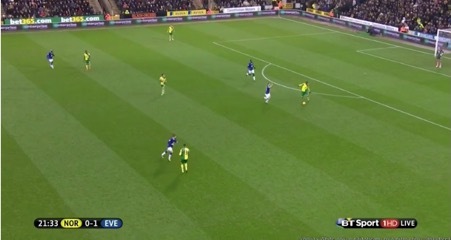 You could almost sense what was coming, though: as counterintuitive as it was given Everton’s superb play to this point, and Norwich’s vulnerabilities being exposed time and again. As the ball broke between Kone and Rudd, he looked favourite to get to the ball first- which he did- but a combination of the Ivorian not really being savvy enough to take it round Rudd, or dink it over him… Coupled with a good starting position from Rudd who was decisive and charged at the ball with speed to smother the opportunity, meant another chance had passed us by. But he didn’t work the ‘keeper. The shot was dragged wide, failing to work Rudd. A host of chances: enough to win two games, had all been and gone in the course of a half of football- only the single goal to show for all of our good work. Only to curl another shot just inches wide- off target, again. A failure to work the ‘keeper from another excellent chance. A half packed full of chances came to an end. The game should be well over by now. Four or five wouldn’t have flattered us. Six wouldn’t have been unreasonable, but it was one. 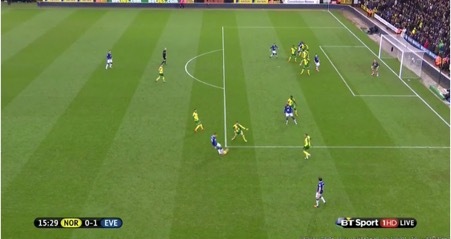 Oh Everton. The boots of our centre halves didn’t even leave the ground as Bassong and Bennett climbed. It’s a token arm push/feel by both Mori and Stones. The Norwich players both want it more. Looking great with the ball at your feet is lovely, but you need to do the actual defending bit from time to time, too. Channel your inner Dave Watson when the ball is there to be won. You can’t win every header… As much as you don’t want the other team to score- they want to, and they’ll put good deliveries in- you will concede from set pieces from time to time- but this is unacceptable now. It can’t be this easy- it can’t be as easy as it has been for teams all season long. You’ve got to be at least close enough to spoil their jump- put them off. I doubt whether we’re going to see another short corner against us for the rest of the season, because we’ve shown our weaknesses, and make no mistake about it: our weakness has been seen. A lack of organisation and desire. Nobody looking to take responsibility for the situation- passively observing as the chance unfolded. The last three goals we’ve conceded in the last three games have all been headers from balls out wide. Each one of them have been equalisers. Six points lost- we would end the day six points off United in fourth. Of course, our defensive troubles go way beyond the last three games- and it has to be said: it’s about the first sniff Norwich have had of our goal- we should be able to concede at this point and give a bit of an ironic cheer as the ball goes in- because we should’ve been five up. But we weren’t. We lost points again- defence and attack both have to take their share of the blame for yesterday: it wasn’t one or the other. 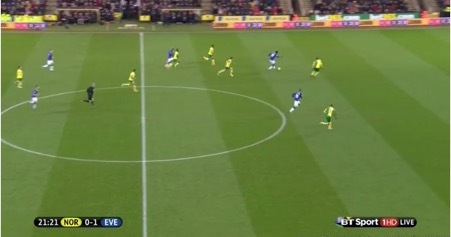 It was Norwich’s turn to press, now…. The only saving grace of this Jerome chance was the fact it was a chance for Cameron Jerome. And he blazed it over the bar. Still, reassuringly familiar to see us opting to not mark players in our own box. 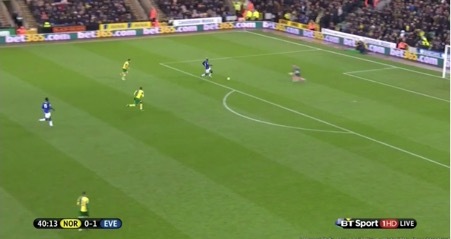 There was a chance for Gareth Barry, too, but Rudd did well to smother a save. It was a poor second half from Everton, and thanks to our poor finishing and lax defending, we’re exactly where we deserve to be in the league. As disheartening/frustrating as it is to see a team look so good, and be so promising, until we get better at defending between the posts, we’ll continue to let opportunities like these pass us by. We deserve to be exactly where we are. League leaders Leicester up next: in mid-December… Who’d have thought that? Makes our basic mistakes all the more depressing, given how wide open the entire league is this year.